Securely restore data from your cloud account to your NAS devices via QNAP Express. The most recent version of your files are encrypted and sent to you in a temporary storage device, so as to ensure utmost data security during transit. 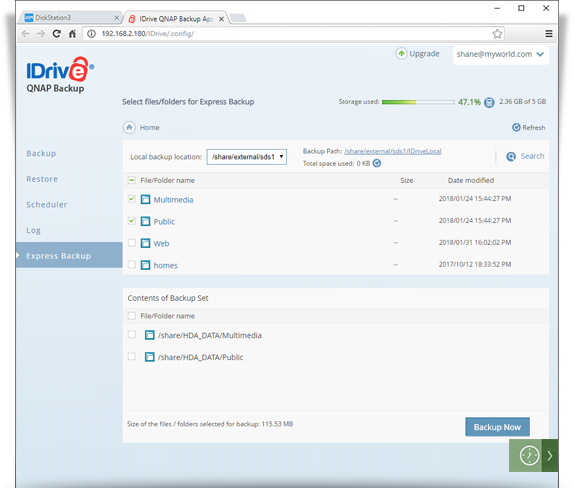 Easily restore your files in original format using the QNAP backup application. Connect the express device to your QNAP NAS. In the QNAP Backup app, login to your IDrive account. 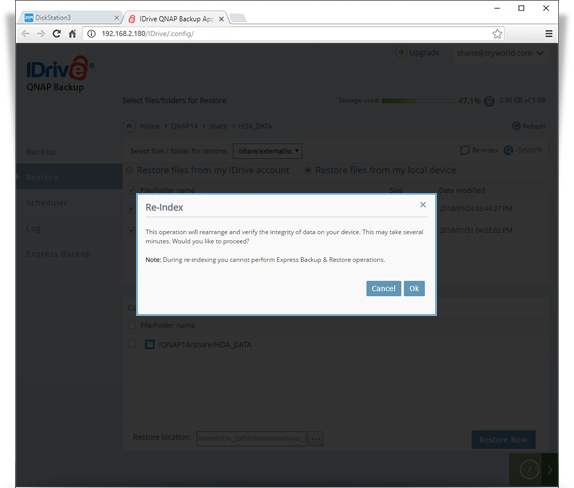 Go to the Express Backup page and in the 'Local Backup Location' section, select the device from which you wish to restore the data. 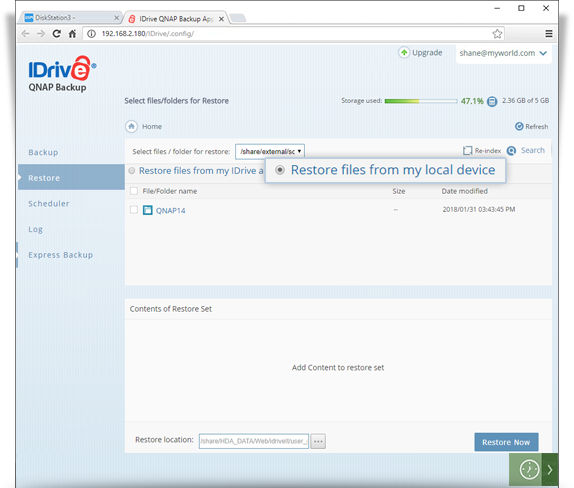 Go to the Restore page in QNAP Backup app page and select the 'Restore files from my local device' radio button. You may not find any data in the local restore tab to restore. Click on the 'reindex' button and click 'OK' in the confirmation window to start re-indexing. Once the reindex operation is complete, you will be able to view all the data present on your express device. Select the files/folders to restore. The selected files/folders appear in the 'Contents of Restore Set' section. Click and type the 'Restore location'. By default, the restore location will be RESTORE_DATA inside the user directory. The complete restore path will be visible in the 'Restore location' field. To start the restore operation immediately, click 'Restore Now'. Click 'Stop Restore', to stop the restore operation. Rearrange and verify the integrity of data on your express device, via the Re-index operation. Go to the 'Restore' tab in the QNAP Backup app page and select 'Restore files from my local device'. Once re-indexing is finished, it will show the directories/files in the 'Restore' section.